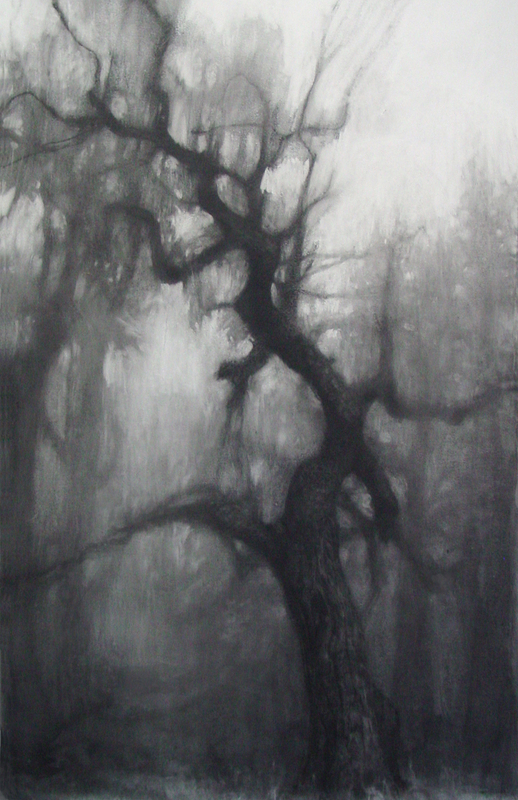 I’m showing new charcoal drawings at The Art Spirit Gallery, in a show that opens Friday, November 10. The works range in size and subject matter…from a series of small whale vignettes (Beached) to a life-sized tree. I will join enamel artist Sheila Evans at an opening for our show, from 5-8. The show will be up through November 25 at The Art Spirit Gallery, 415 Sherman Ave, Coeur d”Alene, Idaho. Open Tuesday-Saturday, 9-6. This entry was posted in Drawing, Shows and Exhibits and tagged Art Spirit Gallery, charcoal, coeur d alene idaho, drawing, exhibit on November 10, 2017 by blackthumbart. Its been a year since Black Thumb Art closed its Oregon studio. We traveled to the East Coast, Egypt, and Turkey before relocating in Spokane. 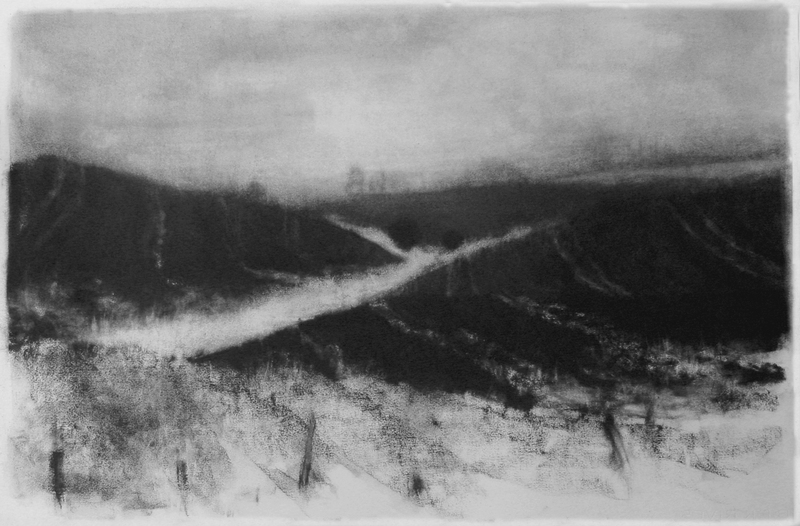 While the new charcoal studio is being built, I’ve been working with different media and processes. For several years I’ve collected photos from the sports section of the local newspaper; images that remind me of religious Mannerist paintings with their twisting figures, mouths agape, and heavenward glances. Before moving, I scanned and printed several of these photos onto paper. 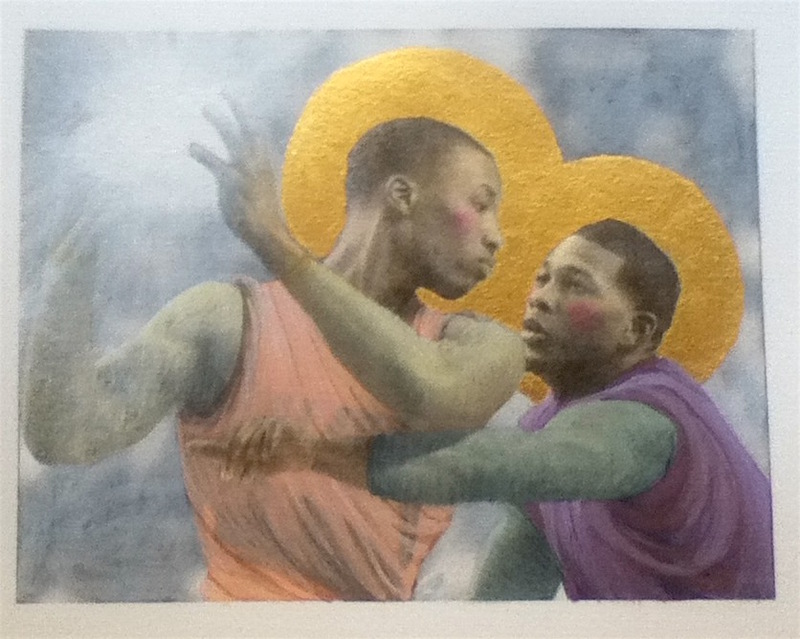 I’ve been experimenting with them since, layering opaque watercolor (gouache) and gold leaf over the images. Recently I used this process in a book I submitted to The Sketchbook Project, part of the permanent collection at the Brooklyn Art Library and one of the largest collections of sketchbooks in the world. 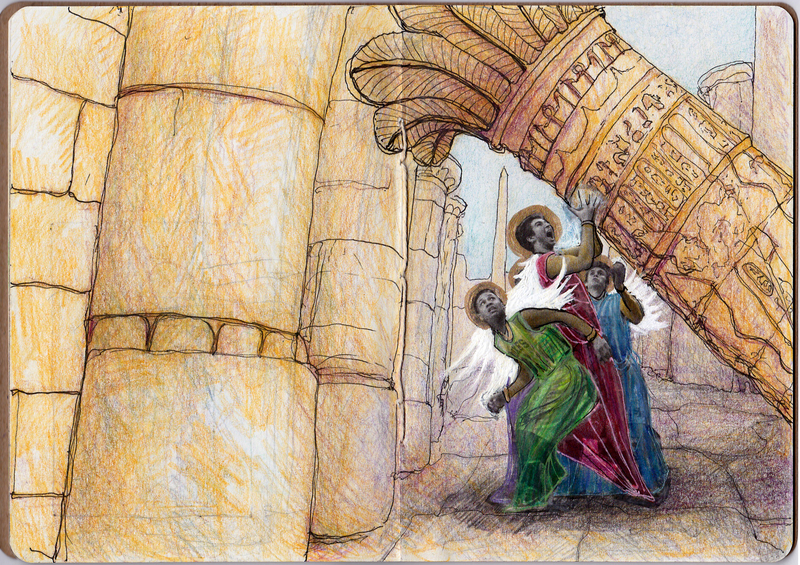 My book, Angels in Egypt, has been chosen to be part of The Sketchbook Project’s Mobile Library tour this summer. You can check it out (literally) if you are in one of the tour cities, beginning this weekend in Chicago’s Millennium Park. 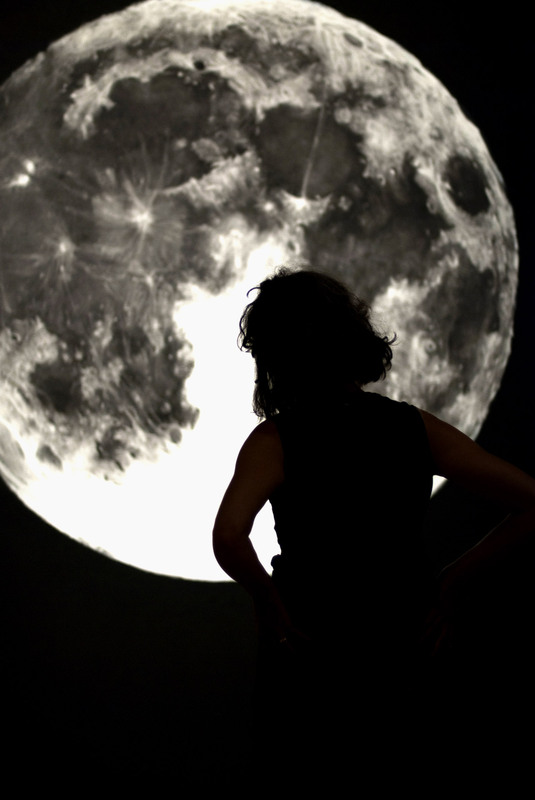 The tour ends August 28th, back in New York at the Whitney Museum. Here is a link to the full tour schedule. If you can’t make it to one of these cities, Here is a link to the scanned version of Angels in Egypt. 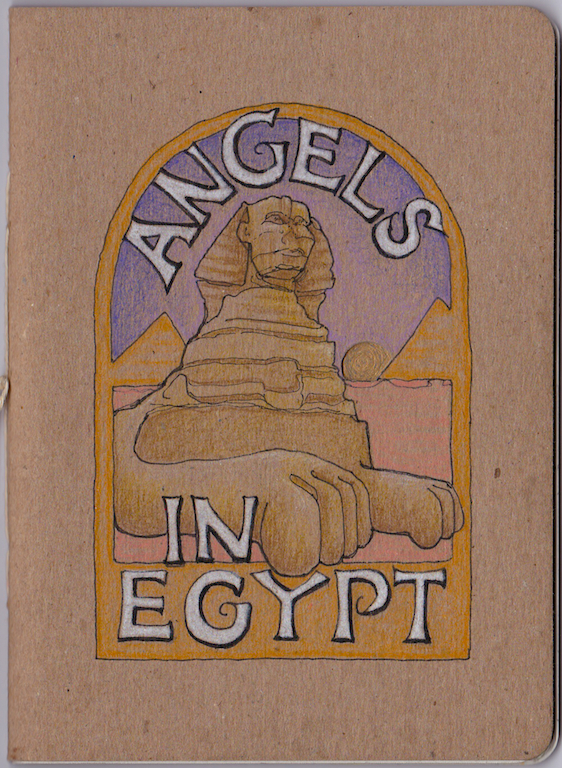 “Angels in Egypt” pages 19-20. Colored pencils, Gelly Roll and Micron Pigma pens. 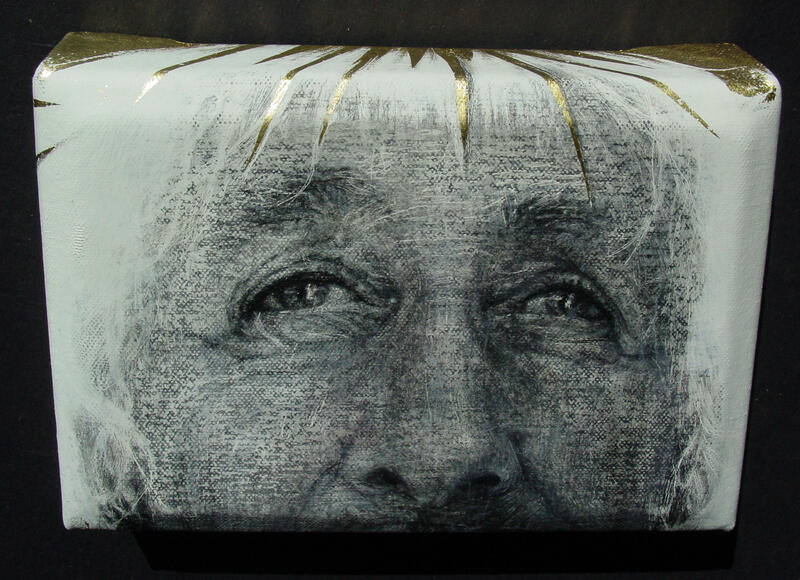 This entry was posted in Drawing, Shows and Exhibits and tagged artist book exhibit, book arts, drawing, Elaine Green, sketchbook, Spokane, The Sketchbook Project on July 17, 2016 by blackthumbart. 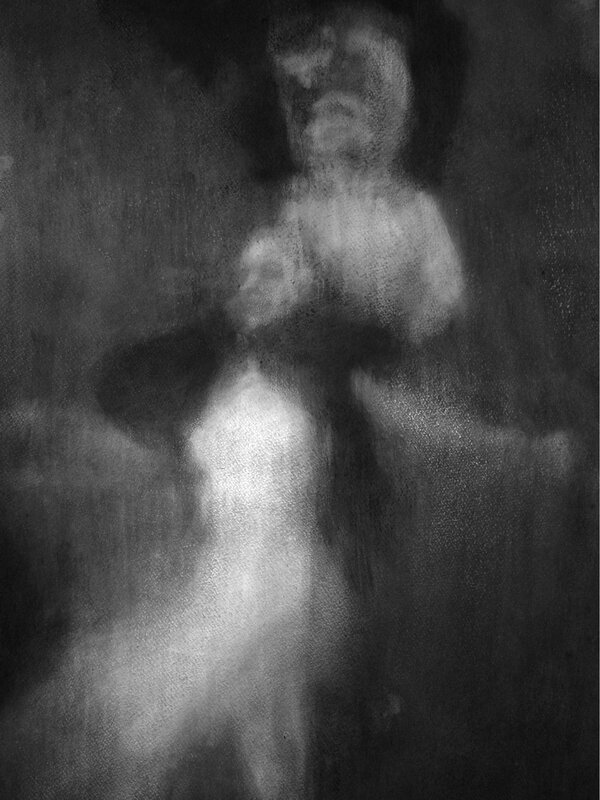 I’m showing new drawings this fall at Chemeketa Community College. 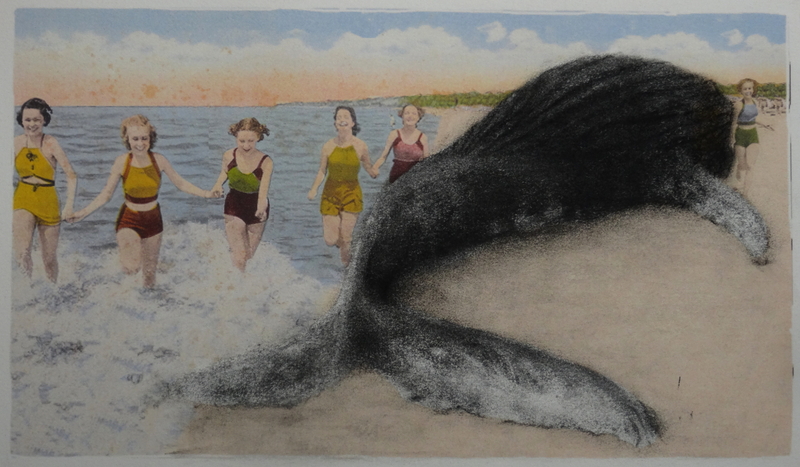 This exhibit features four other artists whose work is focused on the discipline of drawing – Debra Beers, April Coppini, Megan Vossler and Samantha Wall. “Drawing Deeper” will run from Nov. 4 to Dec. 4 in the Gretchen Schuette gallery, located on the first floor of Building 3 on the Salem campus. 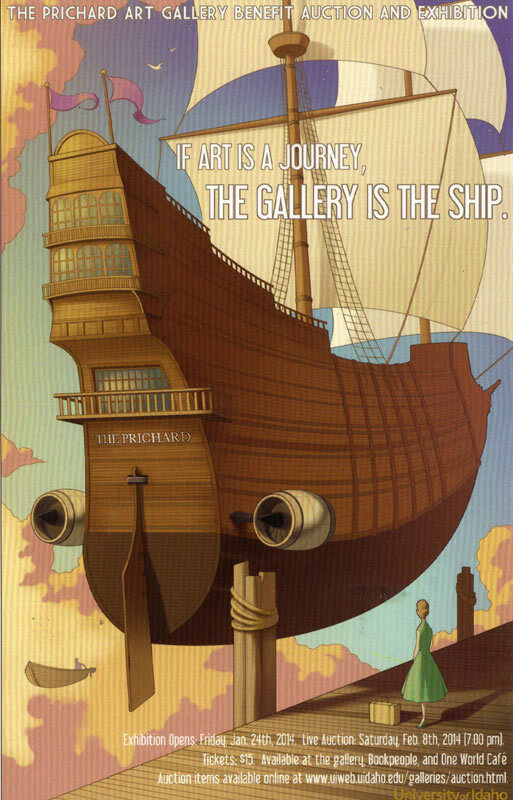 The gallery is open from 9:30 a.m. to 12:30 p.m. Monday through Thursday, 11 a.m. to 5 p.m. Fridays, or by appointment. 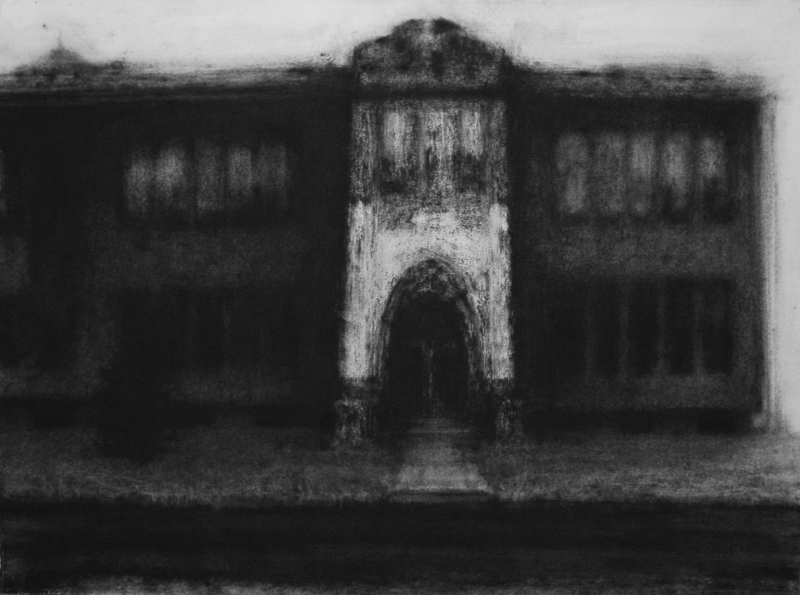 This entry was posted in Drawing, Shows and Exhibits and tagged charcoal, Chemeketa Community College, drawing, Elaine Green, exhibit on November 17, 2015 by blackthumbart. I confess, the month of April slipped past me and I neglected to post an announcement of the spring exhibit, New Work by 13 Artists, at The Art Spirit Gallery. The show ends today, but many pieces are still available, including the drawing above. Now that it’s May and things are less hectic, I’m ready to climb down the metaphorical tree, and back into the studio. 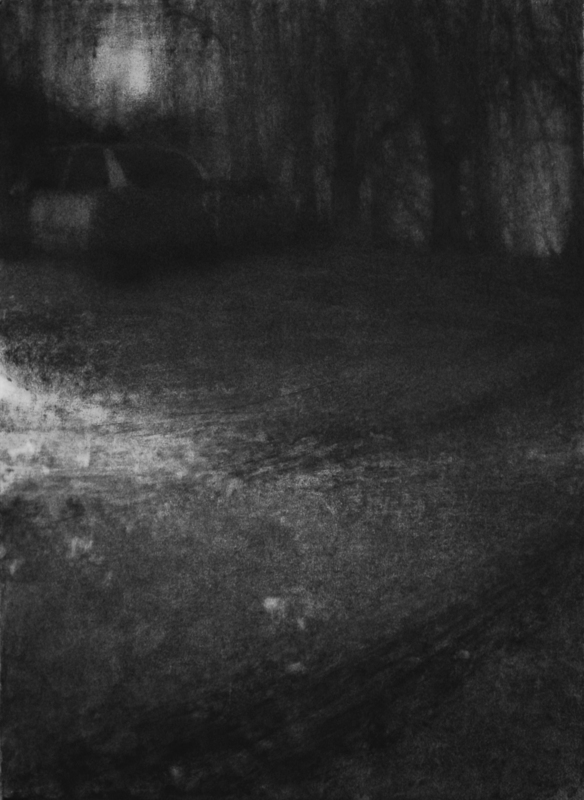 This entry was posted in Drawing, Past, Shows and Exhibits and tagged Art Spirit Gallery, charcoal, drawing on May 4, 2014 by blackthumbart. To a phobic, the depth of fear is wholly out of proportion to the actual threat. Fear of the moon—why is madness called lunacy? Musophobia—even the thought of mice or rats can induce states ranging from panic to paralysis. Two Phobias explores out-sized fear in an over-sized medium. 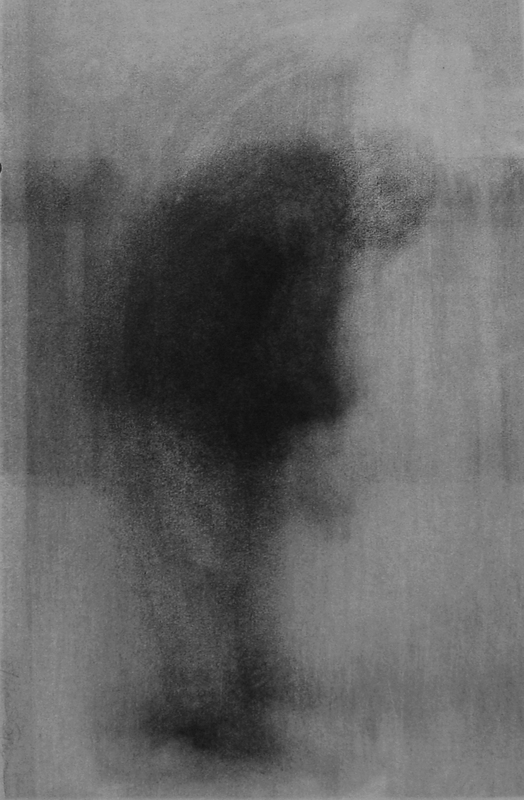 On the work itself, the isolation of space has been enhanced by hand-rubbing charcoal into the chalkboard paint background. Features of the moon are charcoal over white gesso. The mice are drawn hair-by-hair with a silverpoint stylus, a technique I learned at a British Museum workshop in Elizabethan art materials; the images will change over time as the silver reacts to its environment. This entry was posted in Drawing, Shows and Exhibits and tagged British Museum, charcoal, drawing, Jundt Art Museum, Phobia on September 20, 2013 by blackthumbart. My hometown of St. Maries Idaho is having it’s centennial celebration this year, and in the nostalgic spirit of remembering the past, I drew seven images of places and events…from memory. As I tried to remember specifics…was it four windows or five in a classroom…I found some details were clear while others were hazy. 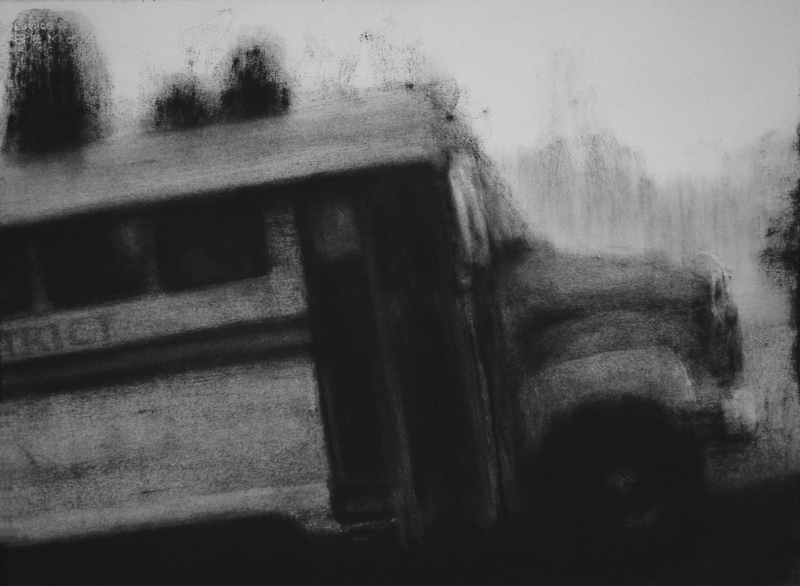 These charcoal drawings of places and events, circa 1967-69, contain a degree of unreliability. I cannot claim they are completely truthful representations since they are based on memories that after more than four decades, are prone to exaggeration, misinterpretation and alteration. Six of the drawings are hanging as pairs in storefront windows on St. Maries’ Main Street, between 8th and 10th streets. They will be up through Labor Day and the Paul Bunyan Days Celebration. Thank you Les Schwab, American Title Company, and Pizza Factory for displaying the work. This entry was posted in Drawing, Shows and Exhibits and tagged charcoal, drawing, exhibit on August 30, 2013 by blackthumbart.